It never ceases to amaze me how my clients' eyes zero in on a particular fabric or piece of furniture, as we review options in the design of their home. Initially they may find it hard to describe what they are looking for, but the minute they ‘see’ it, they know that’s what they want, or don’t want. Although we are all similar in many ways, we have definite choices or preferences in how we furnish our homes. I always look for that ‘aha’ moment or response from my clients to help me to define our plan for decorating. Do you love a bold or classic look? Maybe zen and serene is your style. Refined and elegant may define you. But until you start looking at fabrics, furniture or kitchen designs you may be puzzled on how to capture a look that is yours alone. Today, you can start to picture yourself in your dream home by simply ‘Google-ing’ fabric companies, furniture companies or room settings at HGTV.com. Build a scrapbook of your favorite room settings. That’s the way to get things going. Your dream home may not happen overnight. But it will happen only if you decide today to take the first step. Mary Alice Smith is an interior designer in the New Jersey and metropolitan New York areas. How to keep things simple this season, or at least manageable! I wasn't sure what I was going to blog about today. All day long I was on the road, looking for the best tile, the best fabrics, the best rugs for my clients. When would I have time to blog and what could I say that I haven't said in past blogs? I could write about the great tile selection I found or the rugs that caught my eye the minute I saw them. I could write about how I can pull it all together, so that a room feels just right and looks terrific. But when I returned home and checked my emails, a photo in the email grabbed my attention. I knew what I wanted to say in today's blog after all. The email features a photo of fabrics from the Robert Allen Fabric line. 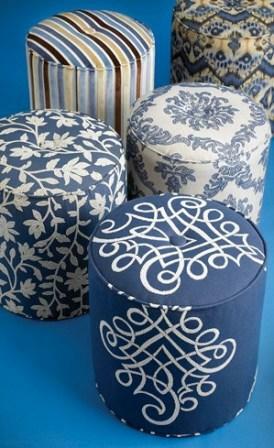 The patterns are crisp and have that 'Joie De Vivre' look. I like the patterns because they can be used in almost any style home to get an updated look. They don't have to be in the blue color scheme. The patterns would look good in red, brown, or green as well. Find place mats that are different - shiny; or wood instead of fabric; round instead of rectangular for this months place setting. Use fresh evergreens from your backyard in tall vases. It's a refreshing switch from the 'plastic' Christmas trees, garlands. Large bowls filled with pinecones always look great, even after the holidays. Less is more - keep things simple and you will finally enjoy the holidays for a change! Mary Alice Smith, based in New Jersey, is an interior designer in the New Jersey and metropolitan New York areas.